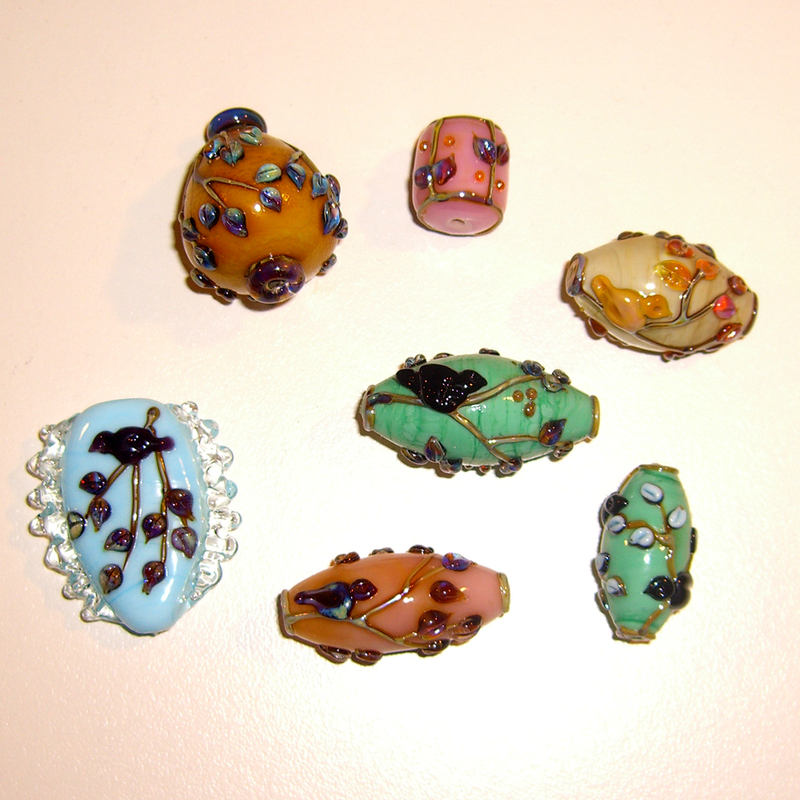 Over the weekend I had time to experiment a bit with some new Flock beads. The question to be answered was one of glass colors. I'm enjoying a lot of the silver glasses, but can't reliably get the colors I want from them. In particular, the fuming from those glasses often ruins base colors. I've found that the blues and greens behave most properly, while yellows and pinks turn muddy. This is as it should be, since yellows and pinks have sulfur in their composition, which reacts with silver to give a brown/black oxide. Of course, I could just abandon the silver glass completely, but there are certain features of it that I'm really attracted to. In the photo, that lovely brown knob on the upper left started off ivory. I'm actually pretty happy with this color here, contrasting with the blues of the leaves. This one was envisioned as a pull for the ceiling fan in my studio. I still can't build the bead I see in my head, which is a take off on one of my journal pages. Can you just imagine? My heart just wells up thinking about it. A way to control the background color and get the nice variations I like. A way to put in the background spiral. I tried this, but used something with too much contrast, so I need to go to something fainter. A way to put the text in. This is where the fine penwork with enamel comes in. A shape that speaks to me better; something a bit unusual. Maybe back to the clouds. I´m sure that the day will come when everything that´s in your mind will get clarified and you will manage everything. As for the background - why don´t you encase it? what if you encase the colors that have sulphur in them with a thin layer of clear? would that stop them from turning color when you fume the silver??? I cannot seem to find an email addy for you, so I'm posting this comment in hopes that you'll see it!